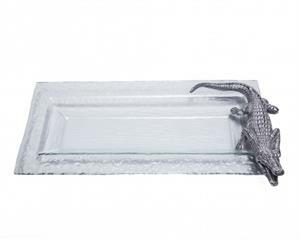 Add some bite to your serveware with this Alligator Oblong Tray from Arthur Court. A handmade, sand-cast alligator fiercely guards the right side of this dish, growing at a would-be stealer of his food. The lustrous, aluminum reptile gleams brilliantly against the clear glass, making this tray a show-stealing addition to any buffet line. Size: Length: 18.0" / Width: 8.0" / Height: 1.5"